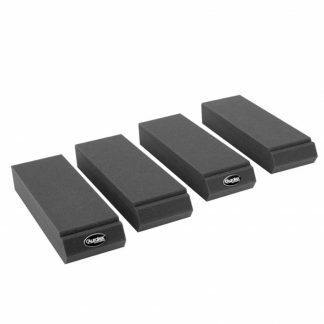 IsoAcoustics ISO-L8R155 monitor stands will vastly improve your monitoring accuracy. Get tighter, more extended bass and more solid stereo imaging from your studio monitors, without investing in new monitors. How is this possible? Well, IsoAcoustics has designed the ISO-L8R155 according to the PIF (Placement, Isolation, Focus) principles of acoustic design. The results are immediately noticeable and dramatic. Placed on ISO-L8R155 speaker stands, decoupled from supporting surfaces, with minimized reflections from nearby surfaces, and properly focused; your existing monitors will amaze you with accuracy you didn’t know they had. 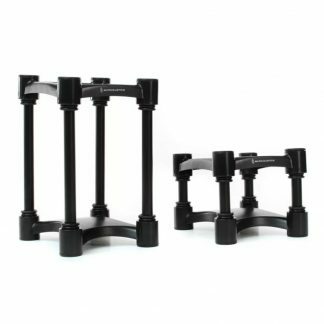 Get better monitoring (without replacing your monitors) with IsoAcoustics ISO-L8R155 monitor stands. 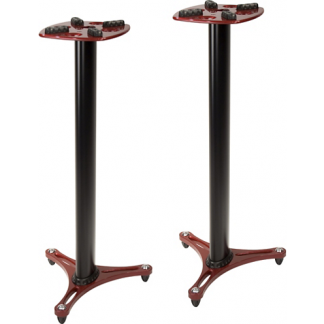 IsoAcoustics ISO-L8R155 monitor stands assist you in proper placement of your speakers according to accepted acoustic principles. Proximity to adjacent and nearby surfaces can create undesirable reflections, smearing your image and wreaking havoc on your monitors’ frequency response. 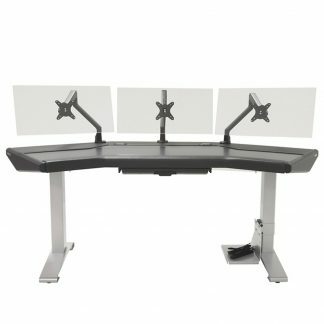 ISO-L8R155 monitor stands raise your studio monitors above supporting surfaces and away from nearby surfaces to reduce reflections. The result is a better stereo image. Raising and tilting your studio monitors to form an equilateral triangle from the monitors to your head (with tweeters at exact ear level) creates an ideal nearfield monitoring environment. The IsoAcoustics ISO-L8R155 monitor stands allow you to articulate your speakers into that position, giving your speakers pinpoint focus that will turn them into true monitors that tell you the truth about the signal you’re feeding them! Get more accurate monitoring with the IsoAcoustics ISO-L8R155 monitor stands!